Huawei’s smartphone branding strategy seems similar to many car companies. Toyota, for example, has the Lexus marque for high-end, luxury vehicles and the Scion marque that develops sporty, lower-cost vehicles with customization options targeted at millennials. Vehicles that carry the Toyota brand target mainstream consumers, covering a broad swath of the market with many different products. Huawei’s Mate and P-series phones are analogous to Toyota’s Lexus brand, catering to the high-end of the market with premium performance and features, with the P-series specifically focusing on design and photography. In addition to its many other phones with varying features and price points, Huawei’s Honor brand parallels Toyota’s Scion, focusing on always-connected millennials. According to Huawei, 80% of Honor “fans” are aged 18-34, and delivering the performance, features, and style this demographic craves, while keeping cost within reason, is a significant challenge for Huawei. After several years of declining sales, Toyota announced that it will discontinue the Scion brand in 2017. As an e-brand that’s distributed online without Toyota’s marketing budget and network of dealer showrooms, will Huawei’s Honor brand suffer a similar fate? For now sales continue to climb, with 40 million Honor phones sold in 2015, twice as many as the previous year. 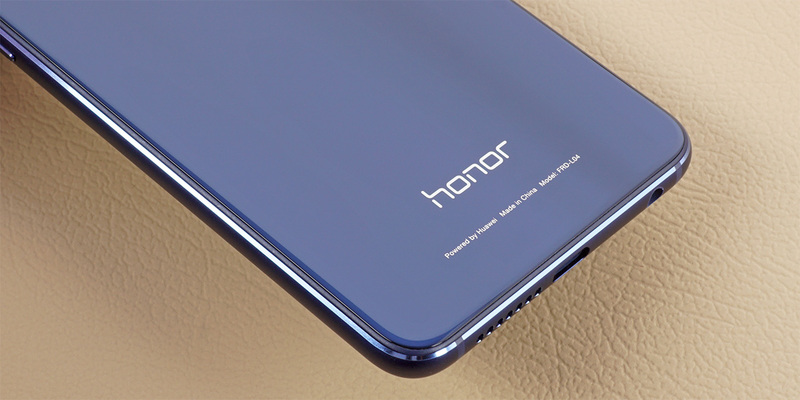 But Honor faces new challenges as it expands into new territories, such as the crowded and saturated US market, where it has little brand recognition. Huawei’s first foray into the US smartphone market was with the Honor 5X, a lower-cost device with a well-balanced design. 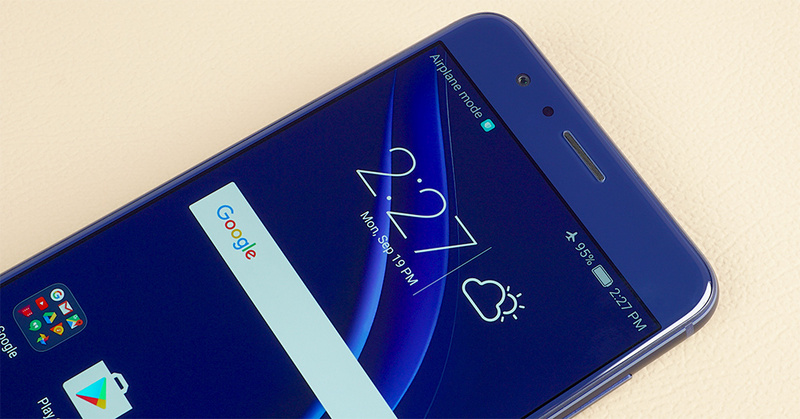 Encouraged by its initial reception, Huawei is back with a new device for the US—the Honor 8. While the Honor 5X hits a lower $199 price point, the Honor 8 costs twice as much but significantly improves performance and features. In many ways, it’s a restyled, less-expensive version of Huawei’s P9. For starters, both phones use 5.2-inch 1080p IPS LCD displays. They also share similar dimensions (the Honor 8 is just a tad thicker and heavier) and the same 3000 mAh battery. The camera setup is the same too, with an 8MP sensor up front and dual 12MP sensors (one color and one black and white) around back, which I’ll discuss more later in the review. Both phones come with either 32GB or 64GB of eMMC NAND for internal storage, which can be augmented with a microSD card. The Honor 8, like the Huawei Mate 8, does use a different SoC from the P9. The four ARM Cortex-A72 CPUs in its Kirin 950 SoC only reach 2.3GHz versus the 2.5GHz in the P9’s Kirin 955, but this will not make a big difference in day-to-day use. Rounding out the big.LITTLE arrangement in both SoCs are four Cortex-A53 CPUs running at up to 1.8GHz and a Mali-T880MP4 GPU at up to 900MHz. While the T880 is currently ARM’s flagship, using only four shader cores limits peak performance. For comparison, the international version of Samsung’s Galaxy S7 comes with a Mali-T880MP12 GPU with three times as many cores. The Honor 8 does make the jump to LPDDR4 RAM, although it’s unlikely this will improve performance because the Kirin 950 and its quad-core GPU are not bandwidth limited. In our Mate 8 review, the Kirin 950 SoC scored well in both peak performance and efficiency, a result of HiSilicon’s excellent implementation of A72 CPU cores on TSMC’s 16nm FinFET+ process. HiSilicon claims that the Kirin 955 SoC in the Huawei P9 is even more power efficient than the 950, so it will be interesting to see how the Honor 8, with the same size battery and screen, compares in our battery life tests. 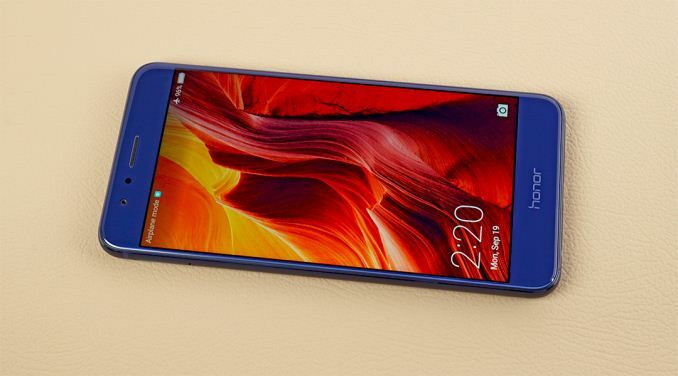 Along with the efficient SoC, the Honor 8 also includes the i5 sensor hub that further reduces power consumption by offloading specialized tasks such as voice recognition, step calculation, and mp3 music decoding to its ARM Cortex-M7 processor. Huawei also includes some software features for further stretching battery life. There are three different power modes—Performance, Smart, and Ultra—that adjust the CPU DVFS curves and tailor network usage. The Smart mode is selected by default and promises a sensible balance between performance and power. There’s also the ROG power saving mode that limits screen resolution to 720p, reducing the GPU’s workload and the amount of data transferred over the memory bus. The power firewall feature (off by default) detects “power-intensive” background apps and automatically closes them. The Honor 8 comes with Bluetooth 4.2 LE and 2.4GHz/5GHz 802.11a/b/g/n/ac Wi-Fi courtesy of the Broadcom BCM4345 (the same solution found in the P9), but does not support 2x2 MU-MIMO like the Galaxy S7. It also comes with NFC, which is absent on all but one version of the P9, and an infrared LED for universal remote control duties, another feature missing from the P9. On the bottom is a USB 2.0 Type-C port for data transfer and fast charging. Residing inside the Kirin 950 SoC is a HiSilicon Balong baseband processor supporting Category 6 LTE speeds—up to 300 Mb/s down and 50 Mb/s up with 2x20 MHz carrier aggregation and 64-QAM on the downlink. The version sold in the US works on AT&T’s and T-Mobile’s networks, and it also supports the necessary frequencies to work in Europe. The Chinese models include support for the requisite CDMA2000, TD-SCDMA, and TD-LTE frequencies used by the national carriers. The Honor 8’s SIM tray holds one NanoSIM card and either a second NanoSIM or microSD card. When using two SIMS, it functions in Dual-SIM Standby mode with the second card (user selectable) supporting only GSM voice calls. There’s two configurations available for sale in the US: The 4GB / 32GB version costs $400, and the 4GB / 64GB version costs $450. Both versions are available in black, white, blue, and gold colors from select online retailers. Chinese customers get a third, less-expensive option with 3GB of RAM and 32GB of storage for ¥1999 (~$300). Qualcomm is a company, not an SoC. Since you obviously missed his point, he was comparing compatibility of Qualcomm's Adreno graphics to ARM's Mali graphics. At least this goes for A72 cores rather than sprinkling 90 A53 cores in there. One time I spent the afternoon screaming at my dresser for its lack of GPU power. It was several hours later and with a hoarse voice that I sheepishly realized I should probably have been screaming at my desktop PC instead. The neighbors heard my ravings through the wall. I don't think they want to talk to me anymore and it feels awkward when I come home from work and we happen to cross paths outside.